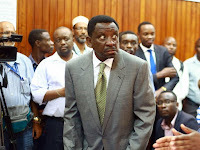 Wednesday March 27, 2019 - Siaya Senator James Orengo is in serious trouble for coming up with a motion to impeach Deputy President William Ruto over gross misconduct. This is after Ainabkoi MP, William Chepkut, lashed out at him over his plans. Venting on social media, Chepkut asked Orengo to fix graft-riddled Siaya County leadership and failed devolution in Luo land before thinking of kicking Ruto out of the Government. “James Orengo comes from a county with one of the most corrupt and incompetent administrations headed by Cornel Rasanga, a non-achiever who leaves Siaya in 2022 worse than he found it. I would first make devolution work in Luo land before thinking about ousting Ruto," Chepkut claimed. The Directorate of Public Prosecution had in 2018 approved the arrest of Governor Cornel Rasanga for using taxpayers' money to purchase air tickets for family members and illegal tendering. Rasanga later bragged how a simple phone call to ODM leader, Raila Odinga, saved him from the prosecutor's dragnet.